Spacious two bedroom Sports Village condo. Open floor plan, second floor unit with covered parking. Full access to all Amenities at Sports Village. Everything you need for a weekend get-a-way. From the balcony off the master you can see the sports court at the club house - so the pool, hot tubs, recreation are a very short walk from the unit. Renovated bathroom, great open floor plan with newer carpet and updates make this unit very nice and clean. Home sleeps 1-5 persons in beds plus a pull-out sofa for 2. Max Occupancy 8 persons. Master: King - Sleeps 1-2. Door direct bathroom, but not private. This home has great parking. 2-3 cars OK. Trailers may need to be parked at the street level. Located in the hills of Green Valley, Sports Village has been a thriving resort community for over 30 years and is well located to key venues, sports activities and hiking/biking trails. There are about 7-9 steps from the street level to the door of this unit. Once in the unit, there are no stairs. Spacious two bedroom Sports Village condo. Open floor plan, second floor unit with covered parking. Full access to all Amenities at Sports Village. Unit available for temporary housing as well as nightly rental. A professionally managed property. This condo was very clean and had everything we needed. It was perfect for our spring break because it fit us comfortably and had plenty of activities to do at the clubhouse. The owner was very helpful and kind! We would definitely stay here again! 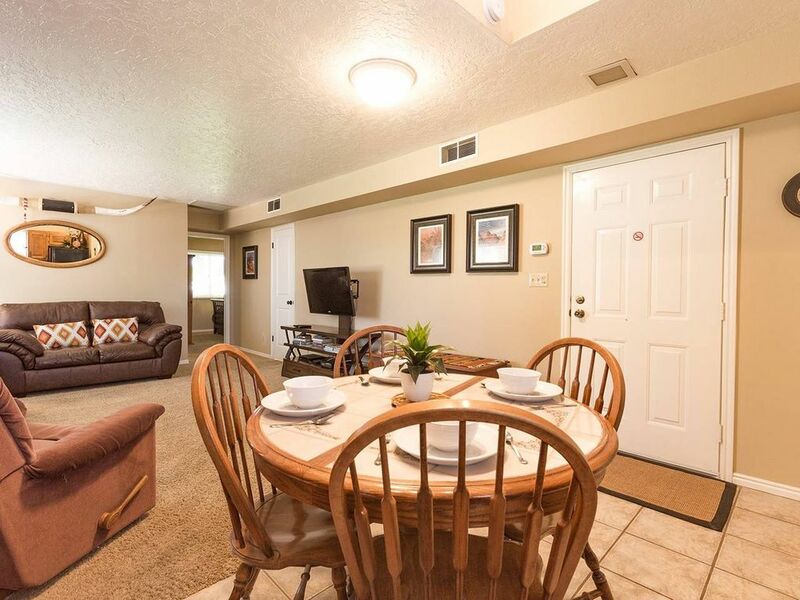 This condo was very clean with comfortable beds and 1/2 mile from recreational biking/hiking trails. Didn’t have any heat for a week. Place is very dark and could use some lights. Didn’t have heat for a week and very dark. Could use a little more lighting. I will take a look at lighting options. This may be a personal preference issue or it could be valid. We'll take a look to see what we can do to make better. Thanks for the feed back. RE: Heat, yes, there was a heating issue. Guest called, we dispatched HVAC company to address. Guest called off the HVAC company and then reported no heat again. We rescheduled the HVAC company again and addressed. Not sure we could have helped any faster. We agree with the guest, not fun to be without heat. Did best we could. Our stay in Saint George was awesome and the condo played a big part in our vacation. It was clean, comfortable, and well-equipped. We fixed a Thanksgiving dinner and had everything we needed. Spent most of our time hiking and touring the many parks in the area, so didn't use the various sports facilities in the complex. The area was quiet, and parking was convenient. Would definitely stay there again! Clean, cozy and convenient, I could not have expected more. Cozy little place tons of stuff to do and everything we needed! Perfect family get away! IMPORTANT: The VRBO/HomeAway quote/book now system may not include additional fees such as pool heating. IF you are wanting to heat the pool/hot tub please be advised that these costs are not included in the rates posted on these sights. Please contact a member of our staff if you wish to add pool heating or to get a quote.